The world of computing has gained depth into the fabric of everyday life and businesses. Buying and owning a laptop is becoming a necessity whether for personal or professional use. Even people that had previously owned a laptop might need to upgrade for better performance. This article will guide you in getting the right laptop at the right price. 1. What do you need the laptop for? First question! 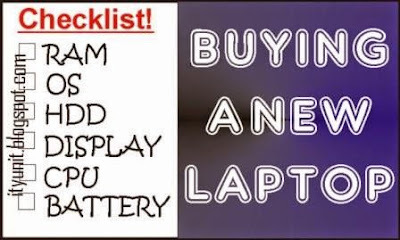 What you intend on using the laptop for greatly influences the kind of laptop you should buy as all laptops are not the same. Is it for playing games, watching movies, browsing or any other personal uses or do you intend to use it for professional purposes like blogging, graphic designs, social marketing etc. Answers to these questions will determine the specifications you need and ultimately the price. 2. What is your pocket size? To avoid spending a fortune to buy a laptop with feature you may never use, you need to outline the basic requirements that you are willing to spend money on and the other requirements you can afford for extra performance. Buying a Quad core laptop for watching movies (which uses only one core for that purposes) is a waste. You need to make an in-depth research on the kind of laptop you wish to buy. If a colleague or a friend has a laptop that you fancy, ask about the features that align to your requirements. GUIDE: Here is a Checklist of very important features that will make your laptop your long term partner. If you are in accounting related business or engineering, you will have a better experience with laptop that features a dedicated keypad (mostly on the right) for easy numerical input. In an office/business environment, you would need to have appendages to your system like printer, scanner, external hard disk, USB charging devices, therefore a laptop with a minimum number of 4 USB port will save you the inconvenience of getting a USB extension port. If your intention is just to watch movies or browse the internet, then mobility and weight will be a factor to be considered, in this case, a small screen size laptop would do. However, if you intend to be opening and working on more than two Windows in one screen, then a 15” and above screen size will be ideal. If your office/room temperature is not regulated with an air-conditioning unit, then avoid AMD powered laptop; go instead for an Intel laptop that can withstand low temperature. Although AMD still claims to be the best in graphics and gaming. To avoid buying incompatible accessories, make sure your new laptop has the basic connectivity tools like Bluetooth ad WiFi inbuilt. This is checking below the hood for the components that guarantee performance. With Windows 10 Technical preview already in circulation, you must get the laptop with the spec that can handle future upgrade. It is very important that you buy your laptop from an authorized dealer that can give you a minimum of 6 months warranty. However, in areas or countries that such warranty is limited, it is always advisable to go with a Technie to inspect and test the laptop before you leave the shop. After physical inspection, you would need to power up the laptop and view the “System Settings” on Windows Explorer. More information about your system can be gotten from the “dxdiag” or “msinfo32” run command.